We have added a brand new default field in to the system that can be used throughout your account. It's a Date of Birth and can be used to search for users with a specific date of birth using the advanced search, can be inserted into Web Forms and can be used as a wildcard in any eDM campaign sent from the system. It can also be imported into the system by CSV. Details on each of these areas are explained below. 1. 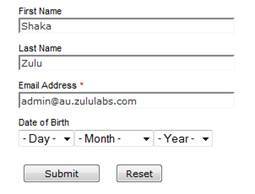 When adding new contacts into the system you can now also add a Date of Birth field for each user. 3. 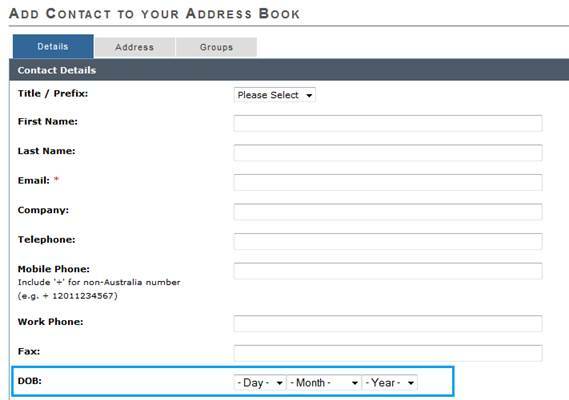 You can also add the Date of Birth Field to any online Web Forms that you have so that when the form is completed the contacts date of birth is saved against their profile. 4. You can also now insert the Date of Birth wildcard into your eDM campaigns so that the contacts date of birth is displayed in the email that they receive. Users who were born in a specific year – if you have an announcement that may only affect a certain age group you would be able to locate the contacts within this age group and send out an eDM just to these contacts.